There might be times when you'll want to end a sequence even if the recipients have not yet replied. We make this easy for you within the Mixmax dashboard. 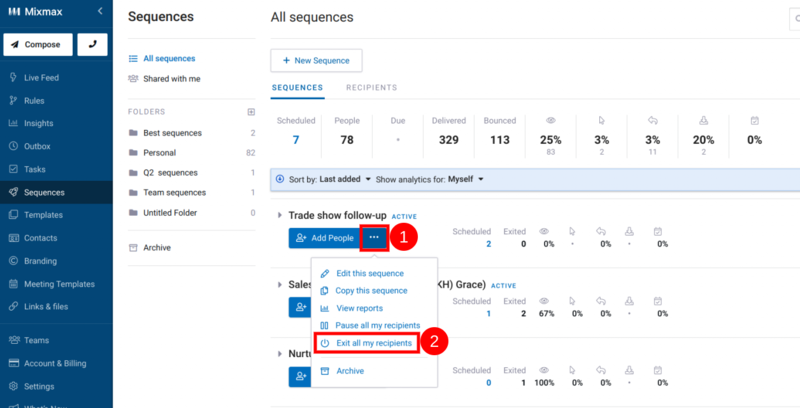 Visit the Sequences section of your dashboard and follow these quick steps to end an active sequence. This will end the sequence for all active recipients - any unsent messages will not be sent and all recipients will be exited from the sequence. When a sequence is ended, you can still reuse it and add new recipients in the future if need be. Learn how to do that add new recipients here. If you would like to remove a specific person from your sequence, see: Remove a person from a stage of your sequence.